Today, we’ll talk about “The Ends Can’t Justify the Means.” In the next post, we’ll talk about “Ignorance is No Excuse.” Both of these are false chestnuts. I’m sure you’ve heard this one a billion times. It’s usually uttered by the hero of a story, against some villain who’s decided to bring about some praiseworthy conclusion by means of a horrific plan. “But I’ll create a better world!” cries the villain, Viktor. We cheer the Herbert at this point, right? Okay. Now let’s take these characters and transplant them into a different situation. Viktor and Herbert are shop owners in Nazi Germany. For months, they’ve been harboring a Jewish family in a secret attic above their shop. This morning, they’ve heard that Nazi investigators will be going shop to shop and asking for information about harbored Jews in the area. Notice how in both cases, Viktor wants to do something considered morally wrong in order to bring about a greater good. But in the latter situation, we can all clearly see that it is no longer Viktor who is the villain — rather, it is Hubert who we all rebuke as morally askew. We’re quite practiced at cheering duty-bound heroes and chastising “good ends / ill means” supervillains. What we forget is that there are plenty of “good ends / ill means” heroes as well, from Oskar Schindler to Rahab, who we (alongside James) recognize as righteous for heroism that required deception. … and you’re really, really sure that they’ll come about. … and you’re really, really sure that there won’t be horrible unintended consequences, neither for those in your local area, nor for the world in general, and neither for things right now, nor for things down the road. There aren’t safer, more praiseworthy ways to seek those good ends. The ends are good, but not that great. You’re not sure they’ll come about. The ill means are pretty bad. You aren’t sure that there won’t be a bunch of horrible unintended consequences. There are safer, more praiseworthy ways to seek those good ends. 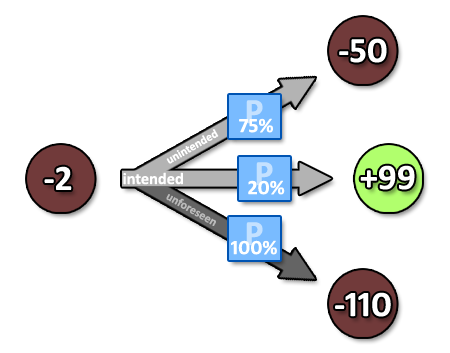 Consider the following diagram, where the ill dark-red “bad” circle is committed, while intended to make the green “good” circle come about. In reality, those “circles” need moral weight/gravity/intensity assigned to them according to what we value. Suddenly, that seems okay. Once we account for the moral weights, a tiny moral ill can indeed be acceptable in service of a huge moral payoff. But it still isn’t that simple! We need to account for the likelihood of that good consequence coming about! But it still isn’t that simple! We haven’t accounted for any of the consequences that are foreseeable but unintended! Ew, gross! This decision is looking pretty ghastly now, isn’t it? … it still isn’t that simple! That’s because there are all sorts of unforeseen consequences lurking in the shadows of human unknowability. It turns out that we, as humans, are so bad at considering the unintended and unforeseen consequences — often when a bee-line prospect looks very tantalizing — that “blind rule-following” has a certain consequential strength or fitness. This is especially the case when, in the shadows of human unknowability, habitual ill behavior can translate into numerous personal erosions of character and will. And that’s why “The ends can’t justify the means,” is a decent “rule” for folks who can’t handle the complications of decision theory, or who think themselves wiser and/or more knowledgeable than they really are — which is almost everybody. That’s what makes it thorny. And so when we’re engaged in lofty discourse about how morality “works,” we need to be careful not to treat that thorny chestnut as fundamental or sacrosanct. For more about how deontology (“morality is about rules”) and consequentialism (“morality is about consequences”) “converge” on the practicalities of human weakness, take a gander at the Angelic Ladder.